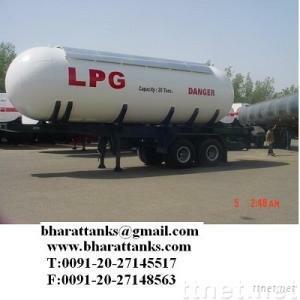 — Lpg transport tank, lpg transport tanks, Lpg Transport truck tank. We bharattanks dot net, lpgmoundedvessels dot com are an ISO-9001 company and largest exporter of gas equipments. We Introduce Our Products. : - 1. Lpg, ammonia, ethylene oxide, Carbon dioxide, Nitrogen, Oxygen, Hydrogen, Propylene, Ethanol, CNG, Glp, chlorine, Propane storage tanks. 2. Liquid Oxygen cold Converters. 3. Liquid argon vaporizer, atmospheric vaporizers. 4. Butane transport tanks, HCL transport tanker, lpg transport tank, Lpg semitrailer, Anhydrous ammonia storage tank &transport tanker, Butane semitrailers, Liquid propylene transport tanker, Liquid ethylene transport tanker, Lpg Carrier, Propane transport tank, Ammonia Transport tank. 5. Lpg terminal, Lpg Air Mixture, Lpg Browsers, LpgVaporiser, Lpg Browser. 6. Imo tank LPG. 7. Mounded tanks. 8. Pressure Vessels & Pressure equipments. 9. Auto LPG underground tanks. Co2 Recovery Plant, auto lpg plant, Surge vessels. 10. Fuel Tanks. 11. Lpg Sphere.